I'm thinking a Vanessa of some sort? All I got from it was a couple of tachinids. is what I'd say it is. All three eastern Vanessa species are usually just a tad more rounded with the projections just a little less developed. Also, the coloring of the larval skin fits N. milberti too. I'll bet there were Nettles nearby? 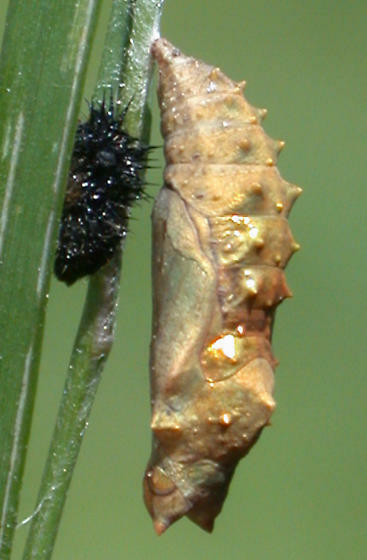 Pupae of certain species of the two genera can be extremely similar. I've reared Nymphalis milberti and Vanessa carye (also called annabella) together, from Arizona, and I didn't even know I had two species until the first adults emerged. The larvae and pupae were nearly indistinguishible unless I looked really closely (and I didn't, at least not at first). Luckily you don't have V. carye in Mass., so it can't be that one. I guess those are the projections you mean. I don't remember the exact spot where I found this (4+ years ago), but there were certainly Laportea nettles on the property; probably some Urtica somewhere. And I saw Milbert's tortoiseshells in the garden all the time when I was living there. There are a few photos for V. cardui in the guide , but I have no idea whether American and Painted lady chrysalises (chrysali?) would even be distinguishable. I happen to have just looked up the plural of chrysalis, since I keep seeing different things, and Webster's gives "chrysalises" and "chrysalides" as options, but not "chrysales," which I've seen a lot. Webster's also confirmed, incidentally, that "exuviae" is both singular and plural; "exuvia" and "exuvium" don't exist according to them--despite the use of those forms all over the web and even in some entomology textbooks.